Thank you to all our supporters and guests for making our 2016 fundraising events a success! 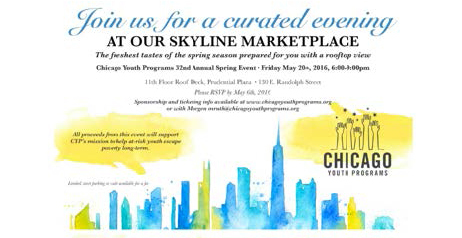 Chicago Youth Programs and Jones Lang LaSalle invite you to attend the 21st Annual Season of Hope Reception. Please join us for an evening of festive celebration to honor our 2016 sponsors, donors, design teams and supporters who have made this year’s Season of Hope event possible. The evening will feature live entertainment with cocktails and Hors D’Oeuvres being served. Thank you to all sponsors, attendees, and volunteers for a wonderful 2016 Spring Event in celebration of our Opportunity Growing Campaign! Held at the 11th Floor Roof Deck at Prudential Plaza, overlooking Chicago’s Millennium Park, attendees enjoyed a curated skyline marketplace with food, cocktails, and entertainment. Mark your calendars for our next Spring Event to be held on Thursday, May 18th, 2017!